Micro size. Maximum performance. 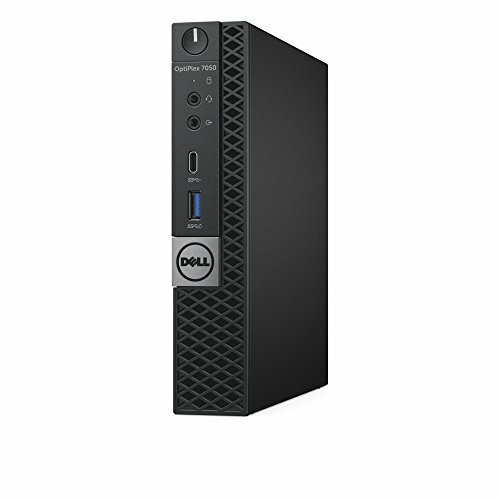 Small footprint micro desktop with Intel vPro Technology delivers full-size desktop performance and features versatile mounting options. Incredibly compact, innovative design. Stay flexible: With full-power features in an incredibly condensed design, the OptiPlex 7050 lets you maximize your work environment. Easy access: With a tool-less design and a simple removable side panel, you have easy access to key system components such as drives and memory so your system can be easily upgraded, remaining viable for years to come. Powerful productivity. Micro design. Power your success: Intel 7th Generation processors up to Core i7 run the fastest OptiPlex yet with 32GB 2400MHz DDR4 memory, while supporting 35W and 65W processors matching all the performance of much larger desktops. Multi-monitor support: Up to 3 monitors can be connected to the 7050 Micro with the purchase of an additional video port. Smooth, speedy performance: Advanced PCIe NVMe drives provides insanely fast boot and data access times. Powerful productivity. Micro design. Power your success: Intel 7th Generation processors up to Core i7 run the fastest OptiPlex yet with 32GB 2400MHz DDR4 memory, while supporting 35W and 65W processors matching all the performance of much larger desktops. Multi-monitor support: Up to 3 monitors can be connected to the 7050 Micro with the purchase of an additional video port. Smooth, speedy performance: Advanced PCIe NVMe drives provides insanely fast boot and data access times.